In Malta, the beaches are open to the public, including when a wedding ceremony is taking place. If you're looking for a ceremony setting that's a bit more exclusive, then a beach may not be your best option. If you're open to the idea of having strangers join you for your big moment, keep in mind that there is another downside to this situation - nothing is within your control. Crying babies, laughing adults and flying Frisbees may all be a part of your ambiance, whether you like it or not. In Malta, a permit is required to get married on the beach, which can present two challenges. First, availability is limited. Only 1-2 beach permits will be issued per day, since that is the limit allowed for officiated ceremonies on any given day. Second, it can take quite a long time to acquire a permit, so if you aren't approved, you may not have a whole lot of time left to find an alternate ceremony venue. If you don't have that kind of time to waste, maybe consider a Malta sea view venue that allows you to drink in all the beauty of the coastline without the hassles of the beach. 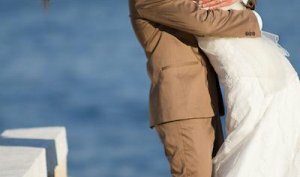 There are only 7 beaches where you can get married in Malta and 2 of them are barely accessible, so your options are limited. To avoid disappointment, do your research and plan far in advance. No religious ceremonies are allowed on the beach, so if you want to honor your faith, you'll need to find an alternate venue for your nuptials. If you were planning to provide food or refreshments to your guests after the ceremony, then you'll probably have to make arrangements outside of the beach to do so. While caterers can access 5 of the beaches, it is on a very limited basis with additional challenges for set up. Because of this, beaches are not usually the best fit for events with meals. When it comes to weather, a beach wedding in Malta offers no guarantees. Rain, wind, heat and other inclement conditions can cause unexpected delays that ruin your laid plans. Reserving a backup venue will give you peace of mind, but it can come at a high cost. Even if you never use that backup location, you'll still likely have to pay the same rates you would if you did utilize it. This is because the venue will want to ensure it earns the same revenue it would if it were hosting a full event with all the amenities. When it comes to your destination wedding, there's no substitute for peace of mind – which you might not get with a beach ceremony. While your dream may have been exchanging vows next to crashing waves, if it causes you to sacrifice many of the other priorities you had, it's probably not the best approach for you. However, fear not. Malta offers a number of alternative options that may delight and surprise you. One of my favorite alternatives to beach weddings are seaside venues. While they are not directly on the beach, they do overlook the sea and feature all the ocean views you've been picturing in your mind. These sea view wedding venues offer a high-class wedding ambiance with more convenience, tighter controls and better back up options. You won't have to worry about special permits, weather interruptions or having a non-religious ceremony. And you can still trek over to the beach for a quick photo shoot to capture a bit of the sandy Malta landscape. Whether you choose to wed on a beach or marry at a formal venue is a personal decision. As long as you're well informed and know exactly what challenges lie ahead, you can pick the perfect location to say "I do" in Malta. Martina Selvagi is a Malta native and destination wedding planner who is passionate about helping couples plan a fun, custom wedding in Malta.